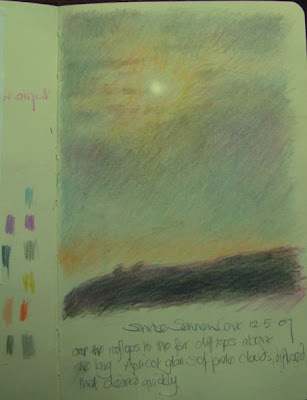 Quick sketch of the sun burning through the dawn clouds in coloured pencil in a moleskine sketchbook. The colours used are on the left hand page. As promised - Links to the participants in my skies challenge. 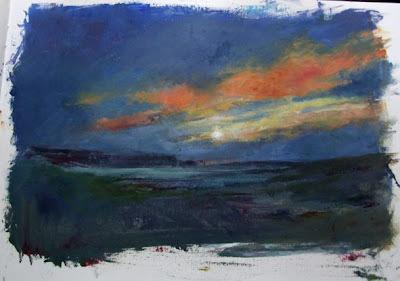 The challenge was to paint skies at different times and in different weathers - from observation not photographs. Reducing the file size for the internet has the problem of tightening work up - these are details of the sketches below to show the loose scribbly marks that makes them. The mine buildings are made of local rock so blend with the environment, though the shapes are stark and man made. 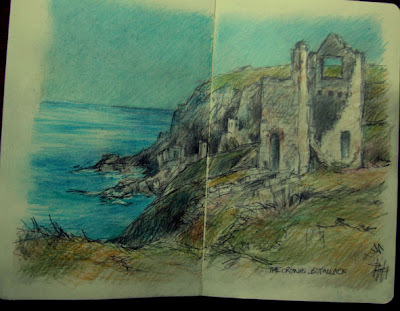 Around St Just and along the coast are dozens of ruins of old tin mines. 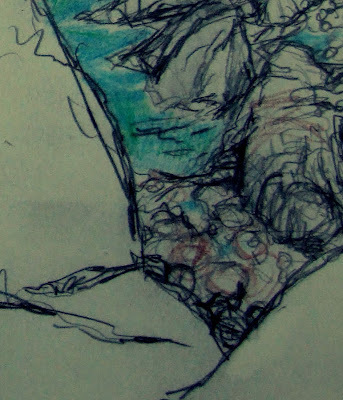 These sketches are of the mine at Botallack. Nearby is a mining museum at Geevor, where you can see how the mining was done, how the tin was separated from the ore along with arsenic and other elements and you can go down a short section of mine and learn about working conditions and life expectancy, which was 28. Spoil was burnt in kilns and other elements extracted, including arsenic which settled on the inside of the chimneys. This was scraped off and bagged for sale by young children. The whole area around the mine was polluted by the mining and is only now recovering. Dawns are more subtle than sunsets but can be utterly beautiful. These were all done on quiet still mornings when the sea was calm. If you are taking part or would like to take part in this - you have until 30th May - I'm going to list the links to the participants then. 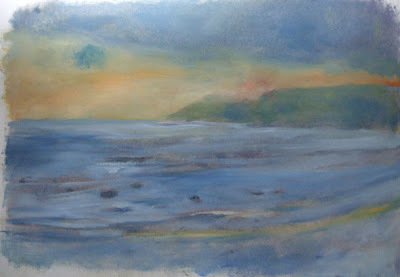 The above image is a quick sunset study in oils in a Canson watercolour sketchbook. I think this beach is called Porth Nanven, it's at the foot of the Cot Valley. The valley is a steep V shape, with a very narrow road leading down it, above a small stream that tumbles steeply downhill over rocks and joins the sea at this tiny, perfect little beach. This is somewhere I want to revisit to paint more. 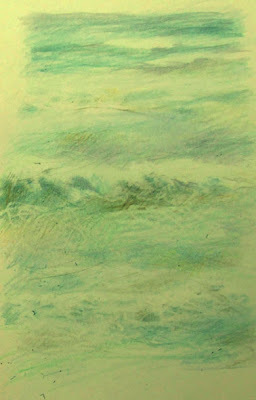 There is a little more viridian in the sea than is showing in this photograph. I haven't quite managed to adjust the colour to show it enough. click the image to see 3 other studies in oil on our Watermarks site. This was a study in (to borrow Tina's phrase) wave mechanics. the movement, how they break - in a steady line across the bay? 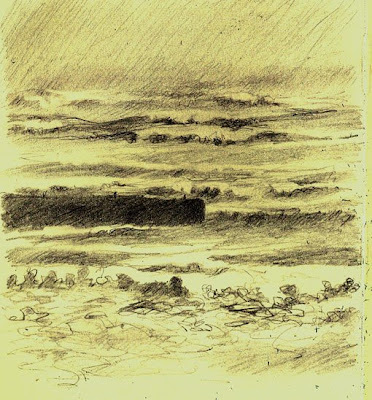 or breaking in several places with the lines of surf meeting up with a splash of spray? 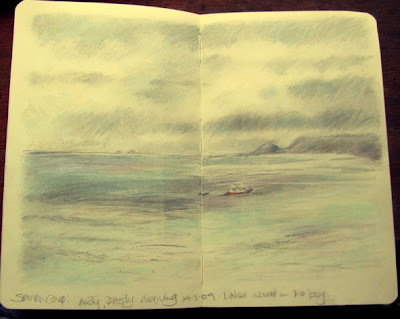 Another early morning sketch, this one in the moleskine sketchbook in coloured pencil. A grey morning with rain clearing - it turned out to be a nice day after this bad start. 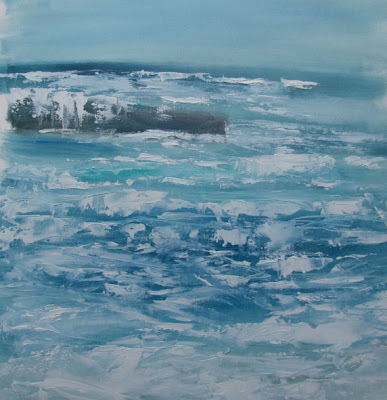 When I was young and lived on the north coast of Cornwall, all the fishing fleet used to move round to the south coast when bad gales were predicted and shelter in the harbours there away from the wild seas. 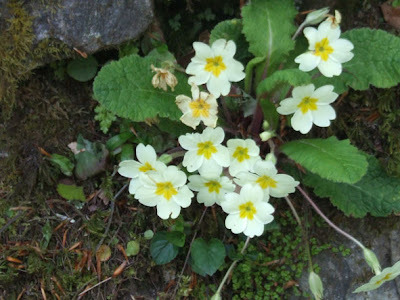 In spring Cornwall and its hedgerows are full of wild flowers. I didn't get to take as many photos of them as I would have liked but here are a few. The ancient hedges have stone walls under the earth, bushes and flowers and were designed to keep livestock from escaping. Travelling off the beaten track, down narrow lanes, the flowers brush each side of the car. If you meet another car someone needs to reverse to a passing place - or if you are unlucky like me you meet a massive tanker and have to reverse half a mile because the passing places aren't big enough to cope! May is a great time to go before it fills up with tourists and of course you are less likely to meet anyone head on in the narrow lanes to the beautiful little bays off the main routes. I put a slide show of photos of Sennen Cove and its waves in changing weather over on Watermarks - take a look. Dawn, the sea is calm with a gentle swell rolling in, no surf this morning and the tide is high. A pale amber glow of sunrise silhouetting the cliffs. Colours are soft and muted, no drama. 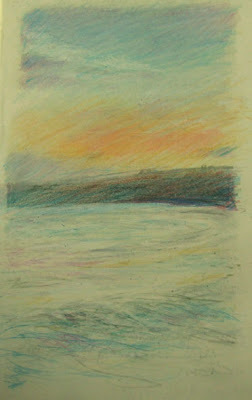 The cove at dawn sketched in polychromos coloured pencils (plus a few odds of others) in the 'large' moleskine sketchbook - they do a really nice larger one now but I'm not sure if the paper is the same. Does anyone know? I really like the surface with cp's. High tide on a windy day with huge swells sweeping in and crashing onto the reef of rocks offshore and over the harbour wall. At the front a confused lacy pattern of foam. This was done last week in Cornwall, in Griffin Alkyds. I love these for working on quick plein airs as they dry overnight. Thinner applications of paint are dry within hours but they give enough time for pushing and pulling colour and marks, unlike acrylics. This speed of drying means glazes can be applied the following day where required instead of a long wait. Griffin Alkyds are proper oils and are used in the same way as any other oils. They are NOT water soluble and are NOT acrylics as some people imagine. Alkyd resin is a drier mixed with the paint to speed and even up drying times and I find this very useful. I'm back from a week at beautiful Sennen Cove with the family - 4 generations of us. We were staying right on the seafront and this was the view from our bedroom window yesterday. Huge waves rolling in and crashing on the rocky reef offshore and over the harbour wall - a wall of mist/rain meaning that the horizon was lost. Luckily it cleared up and turned into a lovely day, though still windy and wild. Look at the skies where you are and do a series of studies from life - different times of day, different weather. Really look at the colours. 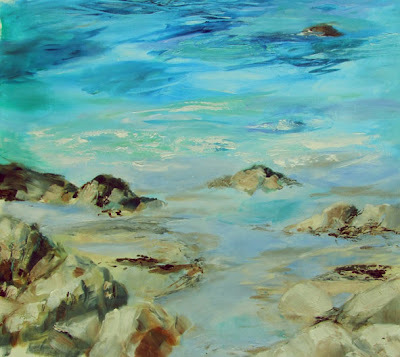 They don't have to be plein air - they could be simply out of the same window, looking at the changes. Then leave links to your blog posts on skies in the comments section. I hope some people feel like joining in :>) and look forward to seeing the results when I'm back online.